Every few weeks (and sometimes even more often than that), dozens of techies gather together for regional Startup Weekends — fast-paced code writing frenzies where entrepreneurs and developers conceive of and build a new application in less than 60 hours (and lose quite a bit of sleep in the process). Many of the apps die off soon thereafter, but some of them live on. And now they’re becoming acquisition targets: Learn That Name, a game that uses your LinkedIn contacts to help you remember the names of your business acquaintances, has been acquired by Gist. Terms of the deal aren’t being disclosed, but the LTN guys say they’re “very, very happy” with the result. Learn That Name was built last August at a Microsoft-sponsored Startup Weekend and won top prize (which was amusing, because it was built for the decidedly non-Microsoft iPhone). The app’s idea came from lawyer Eric Koester, who was inspired to create it after he failed to remember someone’s name earlier during the event. A team of 14 people came together to build the app that weekend, and since then, a subset of the original LTN team has continued working on it, releasing an updated iPhone version, Palm WebOS app, and Flash app. The deal is for LTN’s tech assets, and the proceeds are being split among the 14 original team members. Going forward, the standalone iPhone and Palm applications will still be available, and the game is also integrated into Gist’s own iPhone application, which you can find here. 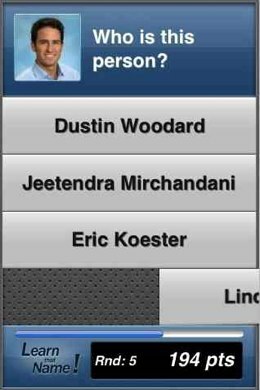 The Gist version will tap into Gist’s database of contacts (the original uses LinkedIn). For those that haven’t used it, Gist offers services that help you keep tabs on the people in your professional network. The service’s web interface allows you to see past messages and attachments from each contact, news about their company, and their recent messages on services like Twitter. Gist also offers an Outlook plugin that shares similarities with Xobni. Given the business oriented nature of Learn That Name, this seems like a good (and fun) fit. Given the success of the Learn That Name team, it will be interesting to see if more Startup Weekend teams continue working together following the conclusion of their events.